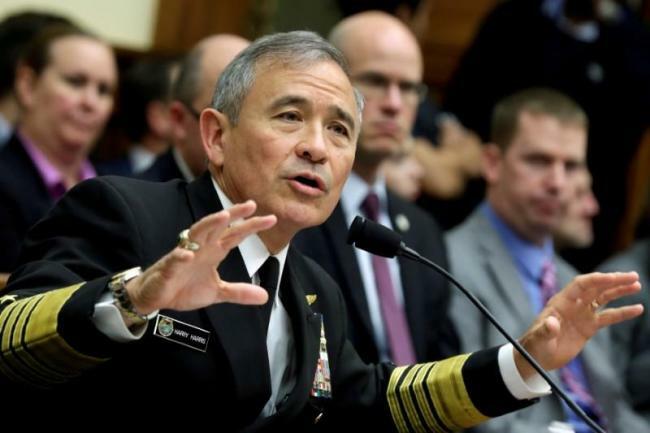 With the nomination of Pacific Commander Adm. Harry Harris as the new US top envoy to South Korea last week, expectations are high about the role that he will play amid the fast-paced diplomacy on the Korean Peninsula. President Donald Trump on Friday nominated Harris as the new ambassador to South Korea, a post that has been vacant for 16 months since his predecessor Mark Lippert left the position in January last year. Harris had initially been nominated as US ambassador to Australia, but was asked to take the post in Seoul by then-CIA Director Mike Pompeo, now secretary of state. Harris is awaiting a confirmation hearing at the Senate. Since taking the helm of Pacific Command in 2015, Harris has been at the forefront of the standoff with North Korea, which launched a number of ballistic missiles into the Pacific Ocean until it declared a moratorium on the tests this year. While welcoming the inter-Korean detente through the PyeongChang Olympics and subsequent diplomatic breakthrough between the US and North Korea, Harris previously warned against North Korea’s motives. “North Korea remains our most urgent security threat in the region. … The Republic of Korea and Japan have been living under the shadow of North Korea’s threats for years -- now that shadow looms over the American homeland,” he said. Given his military expertise of North Korea and the Asia-Pacific region, Seoul-based analysts said the nomination of Harris could send a stern message to North Korea ahead of its first summit with the US and nuclear negotiations. As an outspoken backer of a strong response to China’s aggressive moves in the East and South China seas, Harris is likely to play a role in dealing with China, which Trump said might have influenced Pyongyang’s shift in tone ahead of the summit, experts said. “It’s a strong signal to North Korea that it should not do anything absurd to break the current momentum for the summit,” said Shin Won-shik, a retired Army three-star general, who served as vice chairman of the Joint Chiefs of Staff. “I think Harris understands North Korea’s intention and the regional dynamics better than any US general. He is well aware of the fact that if South Korea’s security is at risk, it would only increase China’s influence in the region, said Shin. Describing North Korea as the “most urgent security threat in the region,” Harris told the senate committee in March that Kim Jong-un would “would do a victory dance” if the US succumbed to the North’s longstanding demand to remove its troops from South Korea. Harris’ assertive stance against North Korea and China leaves him at odds with the Moon Jae-in administration -- in the event that the current mood for a diplomatic breakthrough fails to produce a significant outcome to ease cross-border tensions. When tension ran high on the Korean Peninsula last August following North Korea’s ballistic missile tests, Moon opposed the idea of another war on the peninsula and claimed Trump had given his words not to take any military action without getting South Korea’s approval. “The Moon administration might not like the ideas and remarks delivered by Harris. Right now, there will be no significant problems. But there would be confrontations if things get worse after the US-North Korea summit,” Shin said. Some suggested that there might be a “chain of command” issue between Harris and other US four-star generals. Among them are Gen. Vincent Brooks, the commander of United States Forces in South Korea, subordinate to the Pacific Command. In his interview with South China Morning Post, Abraham Denmark, a director of the Asia Program at the Wilson Center, said making Harris the top civilian diplomat in Seoul could “potentially complicate” his relations with the USFK commander and the US defense secretary. But former Gen. Shin dismissed such a possibility, saying there is a clear distinction between the roles played by Brooks as a wartime commander and Harris as a top US envoy to support diplomatic efforts.